Upperlips waxings is the technique of using wax to remove the unwanted hair from the upper lips area leaving it smooth and radiant. Women hate sprouting random chin hair. 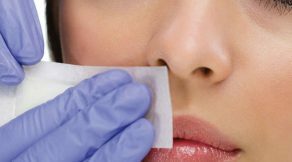 Chin waxing is the technique of using wax to remove unwanted hair from the chin area making your skin smooth and brighter. Forehead waxing and eyebrow waxing usually goes hand in hand. Forehead waxing is the technique of using wax to remove unwanted hair from the chin area making your skin smooth and brighter. Eyebrow waxing is the process of removing excess hair from the eyebrows using the wax. Your hair growth should never stop you from wearing those beautiful backless dresses. Front and back waxing removes the unwanted hair from the area giving you a radiant and smooth look. Bikini waxing is the removal of pubic hair by using wax giving you a smooth look. You can opt for standard bikini line or Brazilian wax. Get the smooth perfection from hairline to toes. Full body waxing includes waxing the area of hands, legs, front, back and Brazilian bikini wax giving you a radiant look. As summer comes closer, you may already be thinking about wearing those sleeve-less tops you have or bikinis. But with sleeveless dresses and bikinis comes the process of removing that unwanted hair. Do you have unwanted facial hair and find yourself frustrated by it? Take a moment before reaching for razor or tweezers set.